Created by Arthur Samuel Joseph, an international voice specialist, Vocal Awareness® is a complete system for mastering your voice and integrating it into your life. Your voice has the power to instantly reach out and connect with people. Vocal Awareness® is about developing this power through self-awareness – learning to consciously express yourself, easily and precisely. Over 4 decades ago, Arthur Samuel Joseph began investigating the connections between language, breath, and psychophysical response. On Vocal Awareness®, you will work along with Arthur Samuel Joseph one on one … gain a new understanding of how your voice works … uncover its connections to your mind, body, and spirit … learn vocal exercises to explore and connect with your feelings … and dramatically enhance your vocal performance. Take charge of your voice – and your ability to express yourself – with Vocal Awareness®. 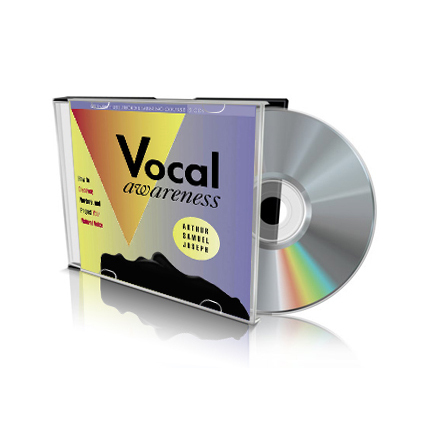 CD Three: The Vocal Awareness® Workout – Breathing exercise; the tongue release; making friends with your voice; the jaw release; the “Yawn-Sigh”; how posture affects your voice; pencil technique for improving enunciation; more. * CD Four: Putting it all together – Aspects of attention; the full Vocal Awareness® checklist; paradox of transcendance; verbal persuasion; exploring your vocal persona; “Yawn-Sighs” with words; the Three Aspects; male and female vocal powers; improving your dramtic reading and public speaking; more. * CD Five: Music and singing workout – Music and exercises for 10 songs.